What’s worse? The fear of change or the fear of missing out? While it might seem easier to sit tight and avoid the risk of change for now, implementing workforce management software could actually change the way your business operates, and therefore, grows. Using digital systems, you could expect to attain one, several or all of the above business benefits. To know exactly how it helps businesses like yours meet ambitious growth targets, let’s dig a little deeper to explore how implementing the right software achieves these goals. Whether your business is in open spaces management, transport logistics services or any other variation of field management, workforce management software can streamline your complex processes. Let’s look at some of the streamlining features a digital system can offer. Bad traffic, poor routing and breakdowns all eat into the money you spend on your mobile workforce. Manual timesheets might not be enough for your business to identify how time is being spent, or lost. Workforce management software tracks worker activities throughout their working day so that you can see exactly where workflow inefficiencies come from. For example, technicians have a precise record of what they need to do and where they need to go to do it. Bad timekeeping prior to workforce management software would have had workers unprepared for visits, leading to multiple visits and unhappy technicians - and customers. The automation means the tracking is more accurate resulting in fewer (if any) errors and omissions than asking drivers to write logs retrospectively. Most importantly, this means you and your drivers get time back, and because time is money workforce management software directly improves your overall profitability. At the heart of workforce management software lies the scheduling engine. 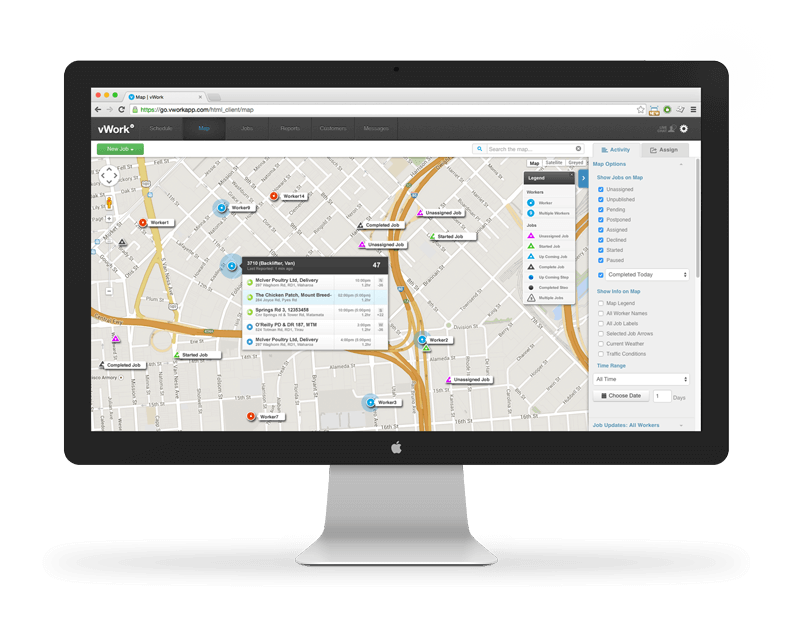 Your dispatch team can view real-time data on the location, skills and status of every worker and every job (past, present and future). The schedule view shows you all necessary workflows, from the work that's in progress to new jobs coming in. The actual progress is measured against the forecast progress which can then be coordinated with the best worker. Being able to match the right workers with the jobs at the right time not only delights your customers but also boosts your bottom line. Once all is said and implemented, workforce management software can bring substantial savings to your business. Streamlined operations leads to higher customer satisfaction and increased sales - in fact, our research shows businesses using it routinely see operational efficiencies improve by 20%. That time saving equals money going right back into your business. Reducing time spent on manual tasks frees up labour costs so that you can invest it in the resources you need for growth. Reducing time-wasting activities, human error and bad habits is all much easier when you have one collaborative system. As your business grows, so does the complexity of your finance team's workload. With workforce management software, not only can you automate billing and invoice reminders, but you can eliminate that maddening box of paperwork that surfaces at tax return time. Automation frees up time for your finance team so that your existing headcount can handle the extra work that comes with expansion. Reducing human error means less time fighting fires and more time for business analysis. When a new job comes in, how quickly can you dispatch the closest worker fit for the task? Not only does real-time data help you minimise fuel costs and waiting times, but the cloud based reporting helps you see weak spots in your deployment processes. 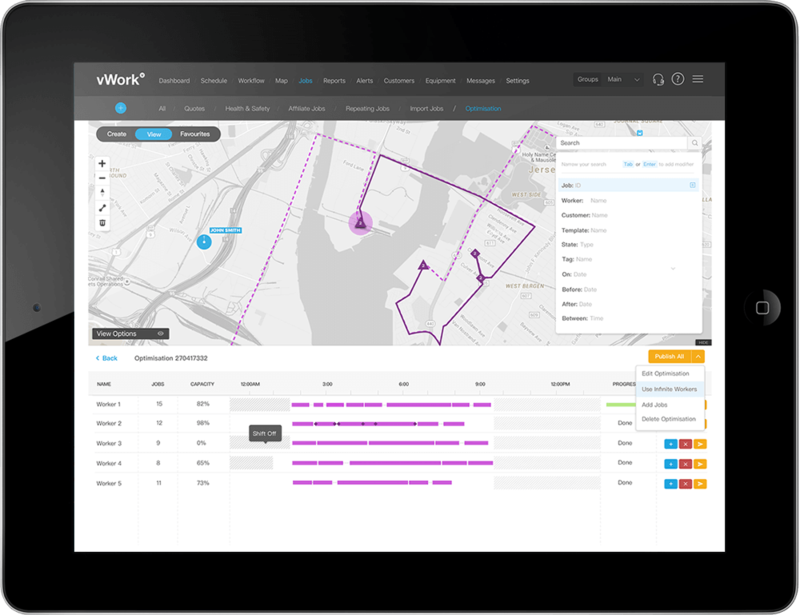 Your operators can ensure the most efficient routes and all job details are shared with the field worker and that they can report back on their whereabouts and progress throughout the day. Charging the customer what the job actually costs to prevent revenue leakage is crucial. Workforce management software can show exactly when users clock in, so if they start a job early, those minutes will be recorded and the business can charge the client more accurately for the work done. For example, if a builder's job is scheduled to start at 12 and run until 5, but the equipment arrives at 11:30 and the driver starts at that time, it’s important for the client to bill for that extra half hour. 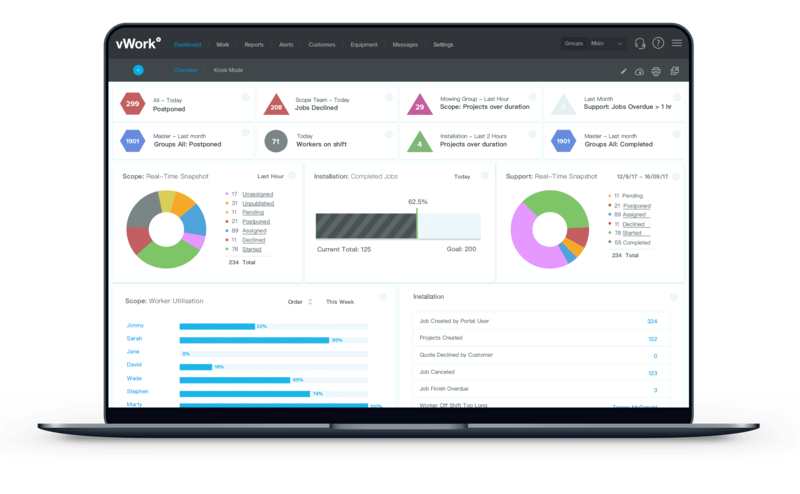 We’ve touched on some of the reporting workforce management software can deliver, but there are hundreds of metrics available. Custom reports give you valuable insight into areas of improvement. Everything from customer service levels to cost management can be optimised by acting on the data captured with workforce management software. How happy are your customers? Rushed jobs, unprofessional customer service and poor timekeeping threaten your retention rates and reputation. Managing field workers and ensuring they uphold your brand standards is notoriously difficult when they work remotely. If you get complaints about your service, you can easily track and trace the cause and also identify if it’s a common issue before it hurts your growth plans. In fact, some of these issues can be nipped in the bud in real-time by connecting your customers directly with status updates via their own mobile device. Alerts on worker location, ETAs, simplified billing and on-demand booking services all make the lives of your customers easier. Your USP is the elixir of business growth. How well do you stand out from your competitors? Providing a top-notch service is critical, but how do you prove your service is the best? If you have to commit to contractual SLAs, you can build those KPIs into your workforce service management software and allow for hyper-accurate tracking of jobs. Similarly, if you are a transport logistics company, workforce management platforms can send your customers pre-job SMS alerts and allow them to email the driver in transit, giving them power to check exactly where their delivery vehicle is, and when they can expect their goods to arrive. Increased efficiency and timely services. Not only will you retain more of your hard earned customers but these key points of difference can help you win new ones. The way that people buy services is changing. Consumers and businesses alike expect faster, more efficient services at their fingertips. What better way to deliver this than through their mobile devices?